Using digital editing technologies, photographic images of Singapore (my birthplace) and Rio (where I live) are appropriated and stretched so that their content disintegrates into abstract indexical signs. The original photographs, of either Singapore or Rio, are images of the underbelly of tourism in both cities, rendered invisible by the hegemonic narratives and national branding produced and consumed. 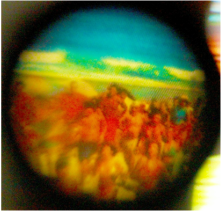 The exact nature of this underbelly is revealed when one peers into a small slide viewer, displayed in front of each projected video. This series intends to confound the line between photography and video by creating the illusion of high-speed movement captured in a slow-motion "traveling" shot. This contradiction is a parallel to the illusory and contradictory nature of tourist-driven development. The resulting abstraction emulates the rapid changes that Singapore and Rio are undergoing, while eliciting a sense of alienation. The distortion of the images also creates a hypnotic effect, much like the effect produced by the incessant exposure to and consumption of mainstream images from the tourism industry. Displayed as a large scale projection, the viewer is immersed in the moving abstract projection and is able to sit or lie down on big cushions on the floor.